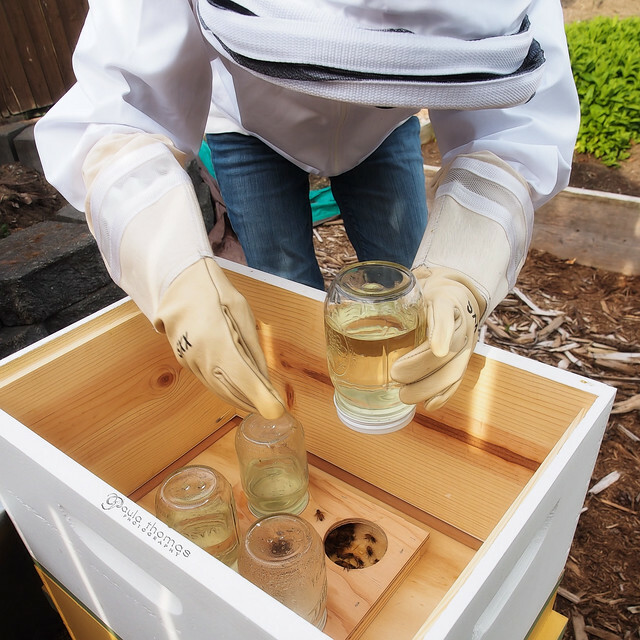 So you want to set up a honeybee hive in your backyard? Be sure to do your research before you delve in. It's not a set up and forget about it hobby. Beehives require regular inspections and are an investment. You should consider getting at least two hives initially. Having two hives helps you determine if there is a problem with a hive (ie. one hive growing much faster than the other). 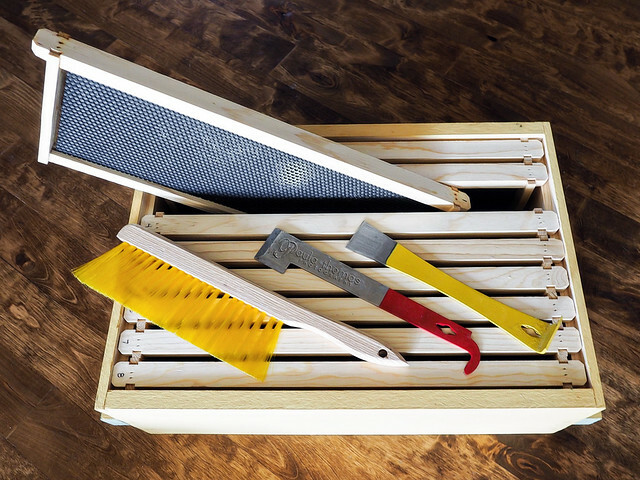 You can also swap frames between the hives to help fix many problems. You will find there is no one right answer. There are many ways to do things and beekeepers have varying opinions about how they think it should be done. I plan on experimenting to see what works best for me. I would recommend taking a class or two or read a few beekeeping books before diving in. It's also very helpful to join a bee club and get a mentor. The two main types of hives are top bar and Langstroth. Top bar hives are single story and have no frames or foundation. 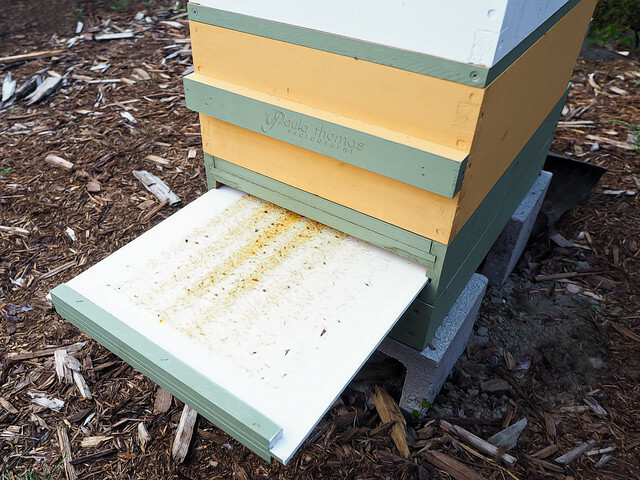 Bars are laid across the top of a box and the bees build their comb on the bars. Langstroth hives are rectangular boxes filled with frames which can be designed with or without foundation. When one box is filled you add another on top. We are doing the Langstroth type and will only be discussing that type going forward. There is a lot of equipment you'll need before getting bees and a lot of options to choose from. Some equipment is necessary and there is a lot more that is not necessary but may make things easier. I spent around $800 for all the equipment and tools necessary for a two hive set up locally. I could have saved some money on some things by shopping for the best prices but had time constraints. For online orders the two biggest companies are Mann Lake Ltd and Brushy Mountain Bee Farm. Bee boxes: There are 3 different sizes to choose from. Shallow, Medium (Western) and Deep. Shallows are mainly used for honey supers while Mediums and Deep are used for the brood (eggs, larvae, pollen, some honey). You can also get these in 8-frame or 10-frame sizes. When using Mediums you'll need 3 boxes for brood and if using deeps you'll need 2 boxes but should always have extras on hand if needed. I chose to go with three 8-frame mediums for my hives because they are lighter and easier to handle. You can buy them assembled or unassembled or you can even make your own. We chose to get everything unassembled which saved a little money. I ordered the boxes through a bee club group buy for $7.75/box, normally around $20/box. Frames: There are also different options for frames. You can get either plastic or wood. The plastic comes with foundation for around $3/frame. Wood frames can be assembled or unassembled, grooved (for plastic foundation) or wedged (for wax foundation). Either type can be used for foundationless. Unassembled wooden frames are around $2 each and assembled around $2.40. Foundation: You can use empty frames and not use foundation but may need to run wires across the frame for support. You'll use foundationless frames if you are looking to harvest comb honey and not use an extractor. The bees will hopefully build their comb in a straight line in the foundationless frame and it's crucial that your hive be level if using foundationless. It will need to be checked periodically to make sure they are building it correctly. If using foundation you can choose between wax and plastic. Both types are around $1.50. Plastic comes in both black and white. We went with the black plastic which makes seeing the eggs and larvae much easier. Top covers: You can choose between telescoping and migratory. 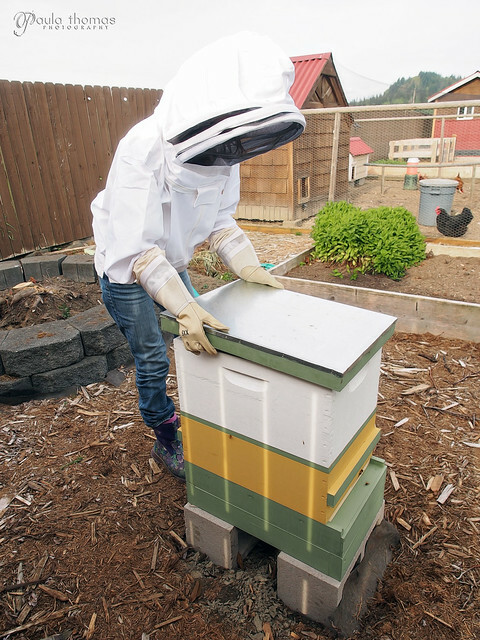 Telescoping covers go over the sides of the hive and have a metal top to helps protect against rain and condensation and is what I would recommend for wet and/or humid climates. Telescoping covers are cheaper and don't require an inner cover and are used in dryer climates, like in the Southern states. Telescoping covers are around $23 online but I paid much more locally. Migratory covers are about $13. Inner covers: Inner covers are only used if you go with a telescoping cover. The inner cover goes between the top cover and the top bee box. The inner cover has a hole in the middle which allows bees to go in and out through the top of the hive. Inner covers are around $12 online and is another item I spent more on locally. 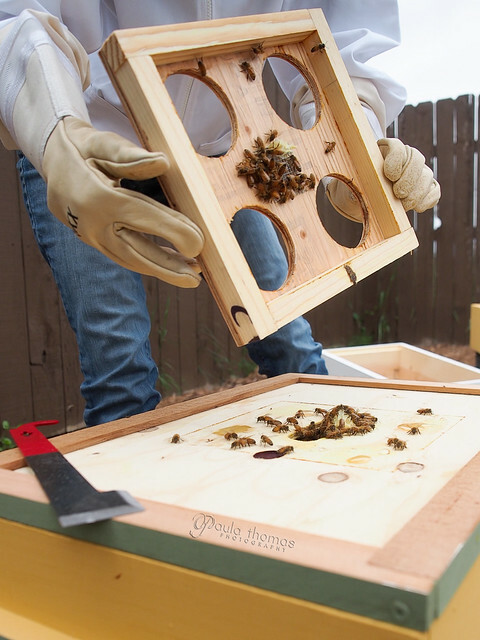 Bottom Boards: The bottom board of the hive can be built with or without a screen bottom. The screen bottom is used for varroa mite trapping. It doesn't really reduce the mite population but allows them to fall through a screen and onto a board that you can slide out to count the mites to see how big of a mite problem you may have. The screen bottom boards are about $20-30 and no screen is $19. I again paid more locally. Hive Stand: The hive should not be placed directly on the ground. For the cheapest route, just get a couple of cinder blocks and set it on those. They are only a couple dollars. We also built a frame out of scrap 2x4s to set on top of the cinder blocks to elevate it a little more. There are tools and accessories that you should get to help protect yourself and make inspections go smoothly. These are the accessories that I started out with but there are many more you can get. This is what I feel are mandatory. Gloves: Be sure to get tight fitting gloves. I would get these locally so you can try them on and make sure you have a good fit. Some brands may fit better than others. They are usually made with either cow hide or goat skin and you can expect to pay between $18-30. Jacket: You can get a full suit but I decided to just get a jacket with an attached hood. This is going to be your biggest expense. The jacket I got was only $80 which appear cheaper than those I found online. You could try just wearing a regular jacket and only get a veil if you want to save money. Smoker: I've not needed to use the smoker yet but the bee population is growing and will most likely use it on the next inspection. This is needed to calm the bees down during inspections and helps reduce the number of bees you squish while doing inspections. They are around $35 online but I paid much more locally. Hive Tool: There are a few different ones out there. I would recommend getting the one with a hook on the end which can be used to lift frames easier. I got one on Amazon for $9 after getting the no hook tool locally. So now I have two. Bee Brush: I haven't needed to use it yet but it may be helpful to brush bees off the frames. They are only $6. Sugar syrup feeder: There are many types but I went with a top feeder that holds 4 overturned jars with holes in the top. The are also feeders that you can put at the entrance or a frame feeder. Frame feeders take up two frame spaces. I wouldn't recommend those if you are only doing an 8 frame hive. The jar feeder was $11 locally. Usually when first starting you will pre-order a bee package locally in late Fall and it will arrive sometime in April. You can also by a nuc (nucleus) which is mini bee box with 5 frames with comb already built. These are more expensive because you get a little bit of a head start. Nuc's unfortunately only come in the deep size and not medium unless it were custom built. The two most popular types of bees are Italian and Carniolan. We chose to go with Italians. Bee packages are around $120 for a 3 lb package which will contain around 10k bees. Some places also offer 5 lb packages. 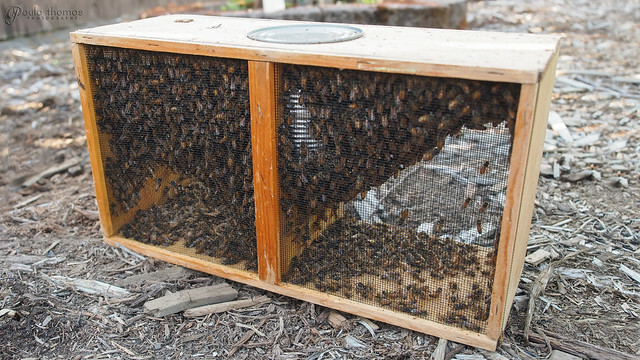 Nuc's run around $150 and also contain around 10k bees. You can pay a few dollars extra to get the queen marked so you can find her more easily and determine if she has been replaced or not. Italians: Light gold colored, making it easier to find the queen. Produce more honey than Carniolans and are less susceptible to European Foulbrood. They may try to keep more brood than they are able to feed and may drift between hives.They are gentle and only make queen cells for swarming or queen replacement. Carniolans: They are darker in color and will forage farther distances and fly in cooler temps than Italians. They are more likely to swarm than Italians due to explosive Spring build up. Russians: Dark colored and twice as resistant to varroa mites and highly resistant to tracheal mites. They are a gentle breed and have queen cells present in the hive most of the time. They only rear brood during times of pollen and nectar flows. They over-winter better than Italian and Cariolans. Here's a recap of my initial cost, pre-tax for two hives plus starter equipment. Remember that you can save some money by comparing prices online vs locally and through group buys if you can find some. I could have saved around $60 if I had bought some of the items online. I'll be posting more about our beekeeping adventures soon.